For you, loudness is cool. You can’t imagine what enjoyment there is in listening to music without monster bass. Small subs don’t hit the mark of sound quality you want. 15–inch subwoofers are made for you. They give out that crazy, amazing bass that will make your car the sound benchmark. Big box, big bass, and loud sound are the deal with these massive subs. If you are tired of the mid-tier bass in your car today, have bigger subs installed. They will rock your music with voluminous bass and give you the best listening experience you’ve ever had. We reviewed the best 15 inch subwoofers to make sure you make no mistake when upgrading your system to produce heavier bass. Not all subwoofers are able to balance precision and power and that’s where our task was.Find out which ones do as you review the following top models one by on. As we reviewed the 8 top rated 15 - inch subs, we paid keen interest on power handling qualities. You already know that without higher power output you cannot get a heavier and deeper bass. Also, big subs require a higher power capability because they often work with amplifiers in the audio system to give loud sound. It’s also noteworthy that sensitivity and sound output are closely related. We therefore didn’t ignore subs that users cited as great even though they have lower comparative power handling. We tried our best to balance all the factors that determine bass and sound performance in a sub and our efforts bore 8 subs. As usual, our review team comprised of highly-experienced sound engineers and installers, real users who are well-versed with car subwoofers and seasoned car audio equipment reviewers. See how the best subwoofer brands are faring in 2019. The HCCA152 is one big rugged box of powerful sound. It produces music with the punch and depth only a few of its competitors would achieve at their best. This booming bass beast comes in heavy and has capacity to reach 5000w of peak power. Loud and powerful sound is an obvious expectation from 15-inch subs. However, the HCCA152 seeks to exceed this expectation with a dual conex flat spider which is combined with loop stitched tinsel leads to allow it pump in big kicks for longer without getting hot. Polypropylene cone is reliable for strong sound production. The sub’s large cone allows for more efficient sound production. Large cone surface area means bigger and deeper bass and this Orion powerhouse has the booming delivery to match its big cone. Consistent, high-quality sound production: Unlike many subs of its size, Orion HCCA152 is designed with a unique voice coil cooling system – the high temperature PAARC system. This feature enhances heat control even more, allowing you to enjoy your deep bass without the slightest worry of system overheating. Sub is well-supported and protected by the rubber tri radius symmetrical surround. Good looks aren’t the only thing you get from this 15-inch sub. The rigorous surround ensures that your subwoofer will last longer and give you music beats that are true to the source. Verdict: Orion HCCA152 has an outstanding build quality and gives really loud but precise bass notes. If you are in for crazy powerful bass, this competition subwoofer will definitely delight you. Discover Orion’s dedication to big, sweet bass in the HCCA152. Check price on Amazon. Are you looking for clean, powerful bass? You don’t have to break the bank for this. The AC15D combines great power handling and the least resistance to deliver excellent amplification. Enclose this 15-inch sub in a ported or sealed enclosure and achieve superior bass without compromising on loudness or volume. What makes Planet Audio the small sound beast with exceptional bass? Pleasant bass quality: Planet AC15D scored highly in production of clean and articulate bass. The 4-ohm dual voice aluminum coil ensures that the sub gets more power and that that there is less resistance for the amp. The result of this is a more superior bass and sound quality. Wire your sub in 3 different ways to achieve the bass you want. Planet AC15D comes with two sets of input terminal so that you can wire it in various ways including parallel, series, and independent. More control over impedance means you determine the amount and quality of bass in every connection. There’s absolutely no need to buy a new 6x8 speakers, 6x5 spekaers or other speakers. The sub works perfectly with the speakers already existing in your system. This way, the speaker relieves you off a significant monetary load and allows you to do a quick, inexpensive sound upgrade. Achieve minimal distortion with the foam surround: The sub’s construction features a polypropylene cone and foam surround. This surround, albeit not very durable, is highly effective in eliminating distortion that may be caused by vibration. Verdict: This sub won a place among the top-performing 15" subs for intelligently combining high power performance and low resistance. It is quite cheap too, which makes it a good purchase under a limited budget. On a hurry to upgrade car stereo bass output? Check out Planet Audio AC15D on Amazon. Our searching and hunting for the best 15 inch subwoofers 2019 landed us on Q Power’s best sub: the QP15. Handling up to 4000w of power and with a strong voice coil, this sub exhibits exemplary bass production. The massive magnet used and high-quality engineering also help to place Q Power QP15 among the most preferred subs in 2019. High power handling capacity: 4000 Watts MAX power rating accords Q Power QP15 the respect of loudest and most powerful speakers. With this sub, there’s absolutely no limit to the achievable sound volume. Crank up the beats and let the sweet bass roll your music as you enjoy your ride. Huge magnet, built with high-quality engineering: The monster magnet used to make the QP15 sub takes the blame of making your car seats like massage seats. It enables the sub to kick ocean deep bass that put more life in your music. Big cone (320mm diameter) for loud sound production: It seems every part of this sub is made for big bass and the loudest sound. This super deluxe sub packs a really big cone that enables for emission of loud, detailed-filled sound. Dual 4-ohm 3-inch voice coils: Of course. What else would you expect to work with a massive magnet? The extra thick voice coils help to deliver heavy sound impulses to the big cone and hold up well to the system’s heat.These coils are highly resilient and so is the entire sub. You are assured of higher durability and continuous bass performance for as long as you need it. Verdict: Go for the QP15 if you are here for loud sound. If it were not for its heftiness, the QP15 would probably be our best pick. Q Power QP15 is absolutely powerful and strong and so is the bass you get. Check price on Amazon. High power on low budget! This is the statement Power Acoustik MOFO-152X left among our team of reviewers. We try to balance all things when choosing the best product in every review. Now, this 15-inch subwoofer presented a number of attractive features at a favorable price. This catapulted it to the fourth position in our ranking. Cone flex completely eliminated: The MOFO-152X has an aluminium-stiffened dust cap that keeps the voice coil cool. Together with a composite sandwich paper, they help to reduce chances of cone flex during high excursion and low-frequency production. Power-packed and efficient: The power handling of this competition sub will convince you to get one. 1400 watts RMS makes the sub quite extraordinary, and for sure it’s performance is beyond expectations. The speaker can output power up to 3000 watts. Ground-shaking bass from the non-pressed pulp cone and polyether foam surround: The cone and surround material are major determinants of the type of bass a sub outputs. 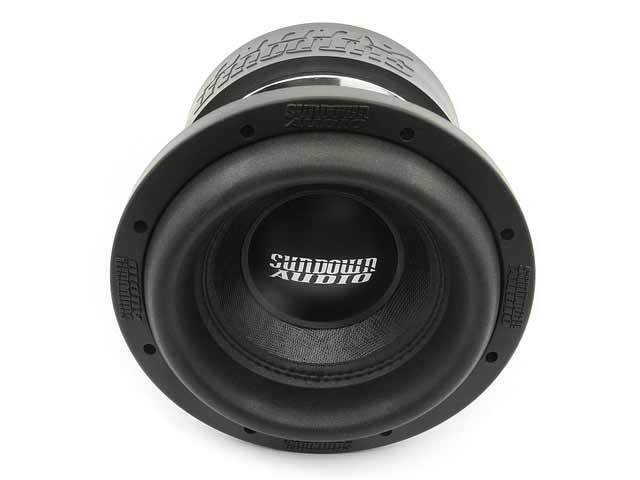 This MOFO series subwoofer is designed to add some bass bumps in your trunk and give your stereo a nice enhancement. High temperature voice coil and over-sized magnet: The sub comes with a 373 ounce strontium magnet structure and dual 2.5” stitched voice coils. This structure is aimed at optimizing power handling and output, and the voice coils can handle high temperature so you have zero worries of overheating problems. The Verdict: Power Acoustik MOFO-152X is a great choice if you want to shake up your listening experience with excellent bass output. It’s also highly durable and comes with a very reasonable price tag. Add these amazing subs in your trunk and they will give back some good value for your money. By now, we are convinced that Rockford Fosgate's Punch series of subs has raised the bar when it comes to sonic excellence. Their dedication to this cause is clearly evidenced by the P3D4 15” 600w RMS and 1200w Peak Power subwoofer. It gives out potent, powerful music that adds an exceptional feeling to your music. Stand out in a crowd with impressive sound: Ever heard of the VAST technology – improves nominal efficiency and sound output? No? Have a moment listening to music outputted by these subs and you will know why it’s one of the top 15-inch subs on the market in 2019. Hits deeper without “bottoming out”: The P3D4 is designed with extended pole piece and special venting to leave more room for heavy excursion and keep voice coils cool. What this gives you is incredible bass performance over long periods. Choose the amount of bass you want from your sub: The 15-inch Rockford Fosgate P3D4 works perfectly well both in ported and sealed enclosure types. This gives you freedom to choose the amount of bass you want to get from your subs and the entire stereo system. Not many subs are accorded industry certification because their performance is sub-par. This is where the P3D4 beats its competitors. We verified that the sub meets CEA-2031, a certification that gives you absolute certainty that it will withstand pressure and its coils will not be damaged. Our say: Rockford Fosgate P3D4 is a hard-hitting product with louder and deeper bass than many subs out there. Most users found the sub to be compatible with their vehicles thanks to the unique flex-fit basket design. You can bet on the P3D4 15-inch sub for punchier and deeper bass output. Skar Audio ZVX-15v2 is your quickest way to hook your music up with some good bass. From a 3-inch high-temp voice coil and a massive 3-slug magnet to a high-quality roll foam surround and premium grade paper cone, this sub is a great promise for excellent sound performance and durability. Make your vehicle sound system more dynamic: Fitted with a massive triple stacked magnet and high-grade pressed paper cone, this sub will push for better low frequencies to make your music fuller with bigger bass. These sound production abilities are responsible for the excellent sound reproduction that we have observed. Catch notes across the frequency range: This Skar Audio masterpiece does not only come with a high peak power rating (3000w) but also a reliable sensitivity of 86.3dB, a combination of features that assures you better performance at various power levels. Best sub from Skar Audio: It’s true that Skar’s subs have just started appearing on the front line and are now ably competing with big boys the likes of Rockford Fosgate. The ZVX-15v2 is one of the brand’s best pieces and you can therefore expect the best from this new competitor. Built to withstand all brutality: This sub portrayed unrivalled resilience when performing at high levels of output power. It has all the build and performance characteristics of a woofer that can withstand a wide range of performance situations without risking damage or easy wear and tear. Verdict: Skar Audio ZVX-15v2 makes a good attempt to challenge leading subwoofer brands. It deserves a place among the bests. Try this 15-inch sub and experience the best of Skar Audio. Is a low-frequency upgrade to your car audio system the only thing lacking in your system? We noted a rather strong engineering and satisfactory bass from this sub.Its power handling may be lower than for most of the 15-inch subs we’ve reviewed here but you’ll realize it produces the greatest bass you can get at that price. Designed for the bass lover on a tight budget: There’s no doubt that this is the most favorably priced 15-inch sub that made it to the top in 2019. 8-ohm impedance ensures that the aptitudes of the bass lover are achieved. You get loud sound with minimal woofer resistance. Allows you to choose the best enclosure for more bass: This Pyle sub works well anywhere. Look for a sealed enclosure to get deeper bass and the sub will be competing with highly priced subs. Reduced background noise: Pyle has worked really hard in this sub to reduce unwanted noise when the sub plays music. The 90.2 dB sensitivity is relatively higher than in other 15 inch subs. It makes up for the sub’s lower power handling (250w RMS). You get crystal clear sound and amazing overall audio. High durability: Enjoy deeper and clearer music from your Pyle sub for longer. The woofer cone is made of strong paper material while the basket is made of stamped steel. These build characteristics enhance the durability and ruggedness of the sub. Verdict: Pyle 8-ohm 15-inch subwoofer can give you clearer and deeper bass if well mounted on an appropriate enclosure. It’s rugged and highly durable; thus giving you a long lasting solution to the weak bass currently ailing your system. Its price on Amazon will surprise you. You’d only be lucky to have these in your car. Here is yet another high performer that comes with a tempting price tag. The Hifonics BRZ15D4 Brutus seems to be making a strong debut into the league of best subs. With premium features and modest power handling, this sub is designed for production of a robust sound. One of the loudest speakers: A power handling rating of 1200w MAX may not be the highest we’ve seen but the Hifonics Brutus convinces that loud music is not all about power. Play any music on this sub and get amazed by how it effortlessly achieves loud sound. DVC 4-Ohm 2.5 inch high-temp voice coils allow the sub to deliver deep bass for longer periods. The voice coils can handle high temperatures, which improves the sub’s heat dissipation and reduce possibilities of breakdown due to overheating. The heat-dispersing ported nickel plated back plate also improves heat dissipation. Dual flat Nomex spider design allows more control on excursion: As already noted, this sub has a unique design and that’s why it surprises one with loud sound production. The two spiders are placed in such a way that there is enough space for excursion and optimal sound production. Highly reliable and durable build: The sub has a rubber surround which not only aids excursion but also increases the reliability and durability of the speaker. Ported nickel-plated back plate and a rigid stamped steel basket further enhance the performance and durability of the sub. Our say: This Hifonics sub ranks almost the same with Pyle but scores higher in sound performance and heat dissipation. It gives great value for your money and we think many users will find it a great bass upgrade. Pick Hifonics BRZ15D4 if you are on a budget and want one of the strongest and loudest 15-inch subs on the market. Why do you need a 15-inch subwoofer buying guide? Big subwoofers are designed to reproduce low frequencies. When these frequencies are delivered properly, they improve the overall listening experience. And this is for all music types. So whether you like soft or rocky or metallic jams, 15-inch subs can really improve sound depth and give your music the realism that lacks when played through small speakers. So what should you focus on when selecting a 15-inch sub to make a great-sounding system? Let’s consider each of these specs individually. Power – Big boom equals plenty of power. The RMS power rating indicates the continuous power output/handling of the speaker. Check this rating to ensure that the 15-inch sub you choose has power handling that matches your system and important components such as the amplifier. How enclosure type affects bass production: Sealed boxes produce the deepest and most accurate sound. But if you are looking for more volume then you will be well suited for ported and bandpass enclosure types. Sensitivity: Measured in decibels(dB), sensitivity measures the efficiency of a sub to produce sound at a given power level. If you have a low-powered stereo, a sub with high sensitivity rating is better because it requires less power to perform. High-powered audio systems can work well with low sensitivity subs. The number of voice coils: Many users prefer dual voice coil (DVC) subs to those with single voice coils. Dual voice coils allow more wiring flexibility. Most high-end 15-subs have DVC; check the performance of such subs in the list of best subwoofers of this category above. What are You Looking for in a 15-inch Sub? Component subs can be mounted in a box of your choice. They allow you to add an external amplifier to increase the sound production potential. You can find 15-inch subs with different types of enclosures, varying voice coil and impedance setups, and operating on low or high power. Choose the model that most closely matches your audio system design or suits the requirements of your desired stereo. In case you have a small car and the space you have is inadequate for installation of the biggest subs, look for powered, compact 15-inch subwoofers. These are usually designed with a woofer and in-built amplifier in one enclosure. So, you only have one equipment to install. Compact speakers don’t take a lot of space in the vehicle. Are compact subs still effective in bass production? With the built-in amplifier, compact 15-inch subwoofers are still highly effective in producing low frequencies. They are also simpler to install which makes them the perfect subwoofer choice if you want a great but quick bass upgrade. You can get what the subwoofer you need to add deeper and stronger bass to your listening experience. The above tips should land you to the 15-inch sub that will best fulfil your requirements. Orion HCCA152 blows you away with its power. It’s agreeable that an RMS of 2000w is enough to satisfy most bass lovers’ thirst for bass. This sub gives you excellent bass with its 2000w RMS and 5000w peak power rating. We found out that the sub can consistently produce deep, clear bass and high-quality sound without overheating or blinking a second. Its rugged build is designed to last so you can prepare to enjoy your big-bass music for years without thinking about going back to the shop. Premium price…yes, and you get premium-grade bass and an extraordinary bass upgrade for your audio system. If you are not limited by budget, this is definitely the best 15-inch sub to have in your car. This thing is a real bass monster. After installing it, you’ll consider sound dampening your truck for it will make you feel like you are swimming in a pool of bass kicks.